Saturated with tears, emotions, and heavy moments, Ruler: Master of the Mask was a rather depressing experience. You might question why I described it as “depressing,” but we will get into that later. If you want to experience a roller coaster ride of emotions and a flood of tears, this drama is perfect for you. But if you are seeking light-hearted feelings and heart fluttering moments, go to the toolbar and click that exit button already. 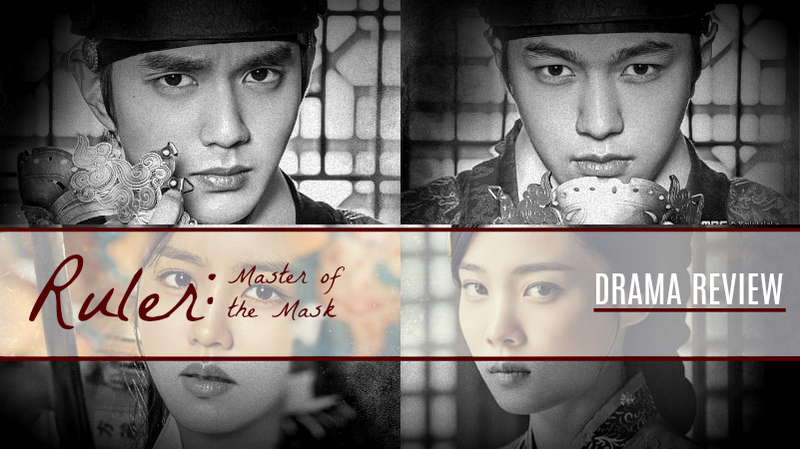 Ruler: Master of The Mask is set during the Joseon dynasty. The drama revolves around Crown Prince Lee Sun (let’s call him Seja to prevent confusion) and his quest to become the king of the whole nation. Seja is forced to wear a golden mask to protect his face from the Pyunsoo organization, a group of people determined to rule Joseon. Led by Daemok, they control people through their addictions to “poppy pills”. Whoever enters the powerful Pyunsoo group is bound to them after their ingesting the poppy pills and becoming addicted to them. They had to take the pills on a regular basis, and if they didn’t, they would die. Pyunsoo controlled the king and monopolized all the water in Joseon by establishing the “Bureau of Water” that made the people fall into hardships and suffering. Seja falls in love with the daughter of the Deputy Magistrate, a lady named Han Gaeun, but under a disguise. Gaeun knew him as Chunsoo, a bookkeeper, and not the crowned prince of the nation. Things get entangled as Pyunsoo pressures Seja into to killing the Deputy Magistrate and Gaeun watches Seja kill her father with her own eyes, planting a seed of hatred in her heart as she vows to take revenge. The plot of the drama was interesting and made it different from other sageuk dramas out there. However, I would point out that I only liked the story during the beginning, and as time passed, it got absurd and really terrible. The finale was satisfying but considering how the writers really forced the story it came across as too spontaneous and ridiculous, which lessened its worth. Crown Prince Lee Sun or Seja, was a hero, no doubt. His only goal was to help Joseon and its people. He was determined and was dedicated to becoming a king for the sake of the nation. He was selfless and was willing to risk anything to achieve the freedom he dreamed of for his country. At first, Seja was not allowed to leave the palace, however, due to his curiosity and enthusiasm, he escaped and tried to witness a life outside the luxury of being a prince. He put up the facade that he was a bookkeeper named Chunsoo, and fell in love with the daughter of the Deputy Magistrate, Han Gaeun. But because of Seja’s recklessness caused by being young and naive, the Deputy Magistrate faced a death that deeply scarred Gaeun and sowed the seeds of her hatred for Seja, not knowing that he was the man she holds endearingly, Chunsoo. The strong and the brave, Seja, was the King everyone deserved. Han Gaeun was a modest, naive, and innocent lady outside the palace. She helped the poor and was the go-to person for people who were sick or being ill. She was one of the few who was able to read and write in her town. Though she becomes deeply scarred as a result of her father’s death, she remains lovely and innocent. I can only summarize Gaeun as a “damsel in distress”. She is annoyingly a little useless and only causes trouble. Her rash and ignorant actions result in the occurrence of a lot of unfortunate events. She redeemed herself by the end however, though remains as a”damsel in distress” that only mattered because she is the main lead. Commoner Lee Sun was once innocent but became greedy and evil. Because of Seja’s recklessness and the King’s heartlessness, the once naive Lee Sun became a monster. He became the puppet king for Pyunsoo in place of Seja who was believed to have died. He endured all the hardships and kept his trust in Seja. However, because of his unrequited love for Gaeun, his hatred grows and he becomes the monster who blocked the eyes of the real Lee Sun. He meets a terrible end and it’s all because of Seja and Gaeun, whom he hated, but at the same time treasured. Kim Hwagun was no doubt the best character in this drama. I’m telling you, without Hwagun, this drama would have already ended by now. Her character was the bravest, the strongest, the fiercest, but at the same time, the poorest. All she wanted was to protect and to shield Seja, and by any means, she would do what’s best for him. With the description of the characters above, you already know what you’re signing up for. Everyone in the acting department was exceptional. Yoo Seungho and Kim Sohyun did not disappoint as usual. The delivery of their lines and expressions were all on point. Kim Myungsoo was also a pleasant surprise. In comparison to his acting before, he definitely improved so much! Unlike before, he is not awkward and can go head to head with Yoo Seungho and other veteran actors yet doesn’t stick out like a sore thumb. Yoon Sohee, despite the amazing heroine role, was a little bit of a let down at first. Her acting was raw and her expressions were funny. However, as the show progressed, she improved and without her magnificent skills, Hwagun wouldn’t be as badass. Ruler: Master of the Mask may be a bit absurd in terms of plot and pacing, but I admit, it’s a guilty pleasure. I still waited for every episode every week to be able to answer the questions inside my head. The drama was intense and thrilling, ensuring that I looked forward to seeing its end. I considered dropping it, but in the final episodes it grew interesting and rebuilt my hype for its ending. Ruler: Master of the Mask was a half-terrible half-satisfying experience. I initially watched it because of L, but stayed because of Hwagun. Though I think it could have been better in every aspect, it still finished on a good note and a clean finale. I would NOT recommend this to you if you are a perfectionist because it has a frustrating number of spontaneity. However, if you can manage to overlook those, you will find it okay and plausible to finish.